The setting was relaxing, a bright and comfortable first-floor lounge in Chu Hall, for discussing a topic that can seem taxing: the college search. 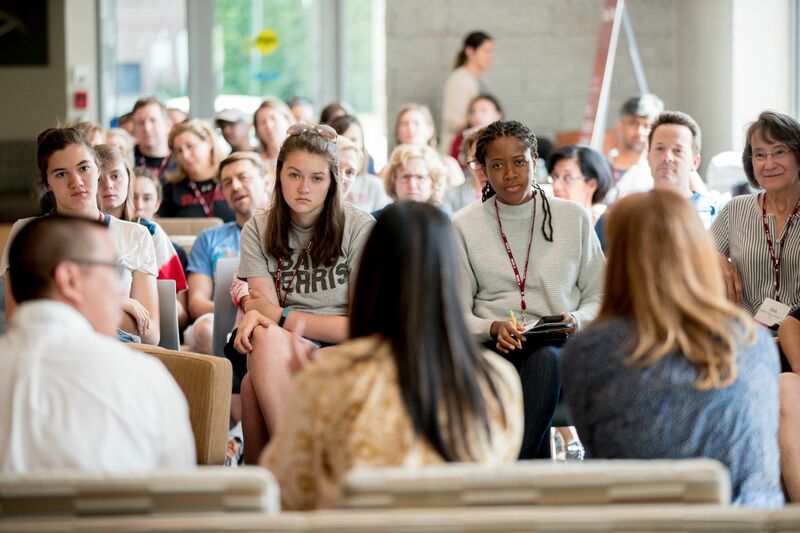 Held last Saturday morning, the Reunion session gave alumni and their college-bound some practical and heartening advice from three admission experts. 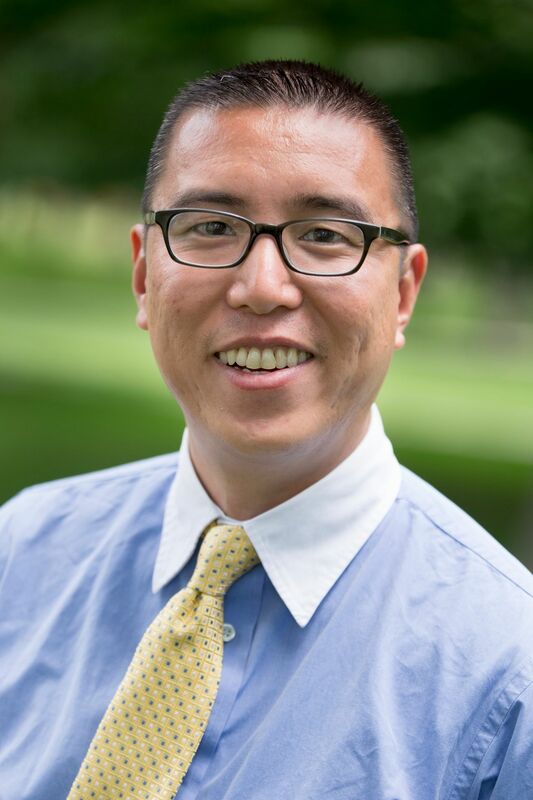 The offerings came from Darryl Uy, who is director of admission at Bates, and fellow admission experts Aya Murata ’92 and Katie Moran Madden ’93. Here are a few tips and observations from the session. “How does a student find a college that matches their interests?” asked a parent, Elizabeth Leavitt Nemirovsky ’88 asked. Murata, who is a college counselor at Phillips Academy in Andover, Mass., was attending Reunion with husband Mike Charland ’93 and their two children, one of whom is a rising high school senior. 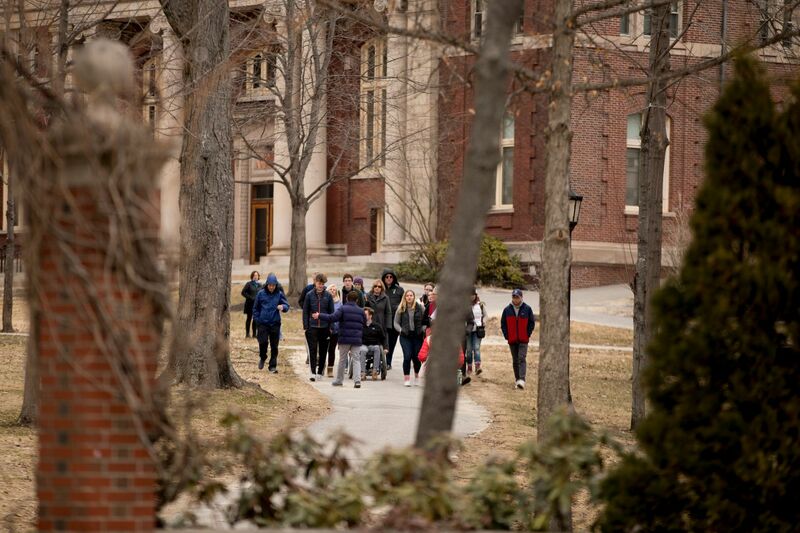 To be sure, there is no “predictive formula” when it comes to the college search, said Madden, who is a senior associate director of admission at Dartmouth. In terms of comfort, each expert noted how the media (and well-meaning family members, friends, and others) tend to fixate on how the college admission process is about not getting into college, when, in reality, it’s exactly about the opposite. 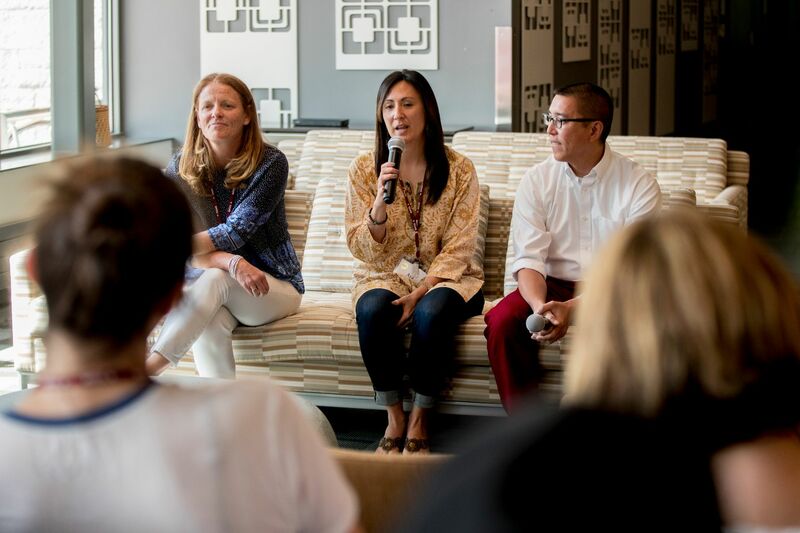 “If one part of you is not aligned in college — if the academics are great but the community doesn’t feel right — you won’t bring your best self to your college experience,” said Murata. The lesson: You should be able to see yourself in your college community. Students get peppered with that awful question, “So, what are you thinking about for college?” That applies “unneeded pressure,” Murata told the parents. 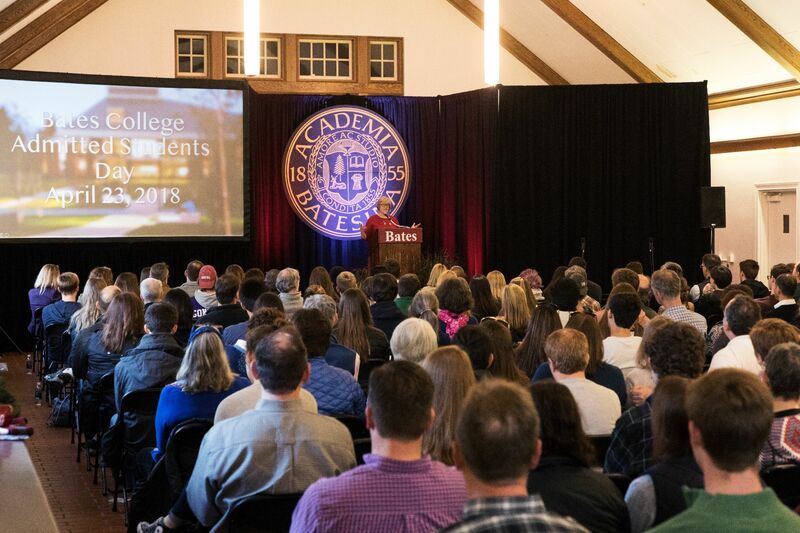 Instead, Murata shared advice that she picked up from Bates’ Purposeful Work program, specifically that adults can help students identify their interests, because identifying what interests us is the first step toward discovering purposeful work — and it turns out, a college that fits. Adults can also be reflectors: reminding students of experiences, such as a favorite class, topic, or program, that jazzed them and thus might hint at a future college interest. Colleges often talk about their values and culture, and those can seem like highfalutin concepts to a 17-year-old. They’re not. Not all students are able to visit a campus. Whether you can visit or not, there are creative ways to gather the more amorphous information. For one, students should check out a college’s social channels or student-driven social channels. Early Decision makes sense for the student who is all-in on one college. But you need to feel a total commitment to a college. “Ninety-nine percent is not enough because that 1 percent of doubt will eat at you all senior year and make you question your decision,” Uy said. Simply put, the essay matters. “It’s one of the more important pieces in the application beyond the numeric measures of data, such as your high school transcript,” said Uy. Importantly, it is also “part of the process that you control,” said Madden. Still, they say, the personal essay does hinge on good writing and an authentic voice. “Try to find a topic that resonates with you and your experiences so your personality and voice can shine through,” Uy said. “Don’t curate yourself to the point you are not authentic,” added Madden. “If you’re not funny in real life, don’t try to be funny in your essay. That rarely works,” Uy said. Students might think twice about arguing a current issue or cause in their essay — but not because it might be controversial. “We want to know about your interests or political perspectives, because we are all shaping communities and we’re trying to encourage dialogue,” Madden said. Rather, in writing about a current issue or cause, “we often learn more about the cause than about you,” explained Madden. And that defeats the goal of the essay. To put their best foot forward, students need to understand what colleges have to do: “We’re evaluating applications from more qualified applicants than we have seats in our class,” said Madden. To do that, “we assess merit, and each college or university may assess merit differently, depending on their own individual communities and institutional needs,” she explains. To assess academic merit, colleges look at a range of factors, especially the transcript. “We also assess merit through extracurricular activities and talents. We assess it through your intellectual engagement, which we glean from your writing and your recommendations. Murata handled a question about parents who call the shots on college choice. In addition to controlling their essay, students also have more control than they think when in comes to recommendations. Since talent is pretty easy to identify — and since every student applying to college will have some talent in something — that’s an unhelpful recommendation. Families should establish some ground rules before they begin the college search so that every encounter between parent/guardian and child isn’t always about college. A longstanding piece of advice is for families to set aside a specific time each week to talk about the college process. It’s a time to share what each of you needs,” Murata said.